The first round of the 2019 NBA playoffs has offered plenty of intrigue to this point and that should only continue on Tuesday night with a four-game slate which features three potential elimination games. The No. 5 Utah Jazz avoided elimination on Monday night as they defeated the fourth-seeded Houston Rockets 107-91 in Game 4 behind Donovan Mitchell's 31-point performance. Meanwhile, the top-ranked Milwaukee Bucks completed the series sweep against the No. 8 Detroit Pistons with a 127-104 Game 4 win. Giannis Antetokounmpo went off for career playoff-high 41 points. 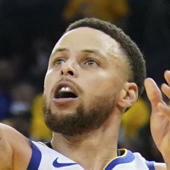 Meanwhile, the Warriors, Blazers, 76ers and Raptors used their weekend victories to take commanding 3-1 leads in their series, while the second-seeded Nuggets tied things up with the No. 7 Spurs at two games apiece. The Detroit Pistons joins the Indiana Pacers as the only teams to be eliminated from playoff play thus far.